Today’s episode is an incredible two-parter from STHLM TECH FEST. 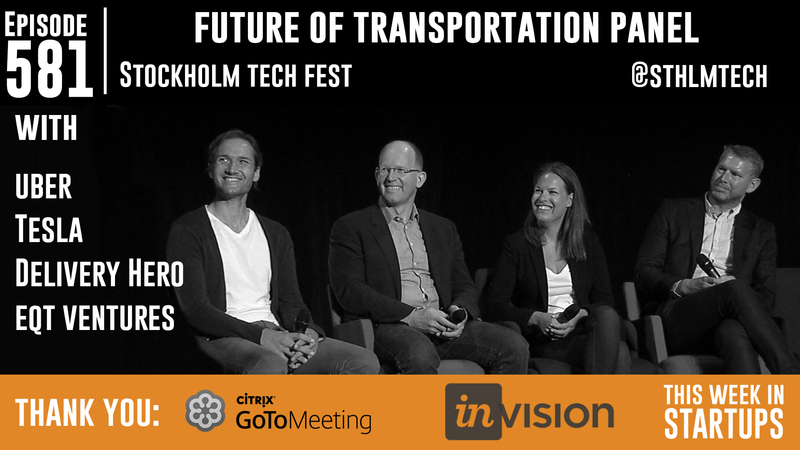 First, a fascinating discussion on the “Future of Transportation” with three companies leading the charge. Jason and Tyler Crowley talk with Uber European General Manager Jo Bertram, Tesla Chief Product Officer Peter Carlsson, and Delivery Hero CEO and Co-founder Niklas Ostberg (online food-ordering service in 34 countries), and Kees Koolen, Founding Partner at EQT Ventures. Among many gems, we learn how leading up to Model S release Tesla was burning $100m per quarter, how the car industry thought they would only sell 3,000 vehicles over their lifecycle (and they now sell 1,200 per week…and are thinking about the future of autonomous cars…. ); how Uber has legalized ride-sharing in most US cities and is one of the safest transportation options in every city they operate in, but still has a fight ahead in Europe; how Delivery Hero has raised $1b and what their path to profitability looks like (scale!) and why they might start making and delivering its own food. Next up we get a visit from the Prince of Sweden Daniel Westling and hear two pitches in the transportation space from Shipwallet (no-click shipping) and Fidesmo (a connected card).